I’ve been trying to update my iPod touch to iOS 6 and it’s not working. I plugged it into my Mac, chose to update it in iTunes, and the update stalled on the iPod—the progress bar never filled in on the iPod’s screen. I waited an hour and still nothing. I unplugged the iPod and tried again. And when I did, I was told I had to restore the iPod. I tried this too but I got into this endless cycle where iTunes would download the latest update, the update wouldn’t install, and then I was told to restore again. Again, iTunes downloaded the update but wouldn’t install it. I can’t use my iPod at all as it only displays the Connect to iTunes screen. What should I do? The Connect to iTunes screen you see indicates that your iPod is in recovery mode and clearly that’s not working. Your next step is to try booting into Device Firmware Update (or DFU) mode. To do this, hold down the On/Off button until the iPod shuts off. Then hold down both the Home and On/Off button for 10 seconds. Let go of the On/Off button but keep holding the Home button for another 10 seconds. 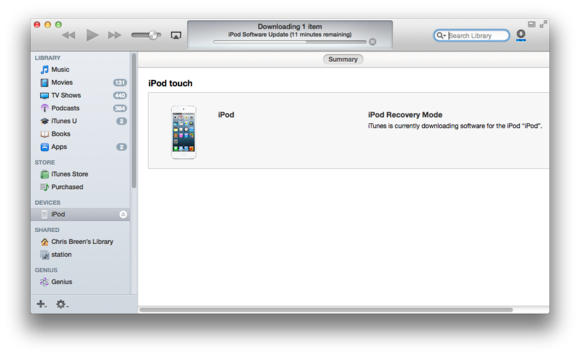 iTunes will tell you that you’re in recovery mode and that you must restore your iPod. Give it a go and, with luck, it will break out of the cycle. If it doesn’t work, I have another solution. The first thing you need to do is locate the update file that iTunes has downloaded for you (it will be named something like iPod5,1_6_1_10B141_Restore.ipsw). You’ll find it by following this path: youruserfolder/Library/iTunes/iPod Software Updates. (You access the Library folder within your user folder by holding down the Option key in the Finder and choosing Go > Library.) Drag this file to the desktop. Download a copy of the free redsn0w application. This is a tool normally used for jailbreaking iOS devices (the current version doesn’t jailbreak devices running iOS 6). But we’re not going to use it for breaking into your iPod. Instead, we’ll engage its powers to force an update. To do that, launch redsn0w, click the Extras button, click Even More on the resulting screen, and click Restore. On the page that appears, click on IPSW and in the navigation window that appears, navigate to the ipsw restore file on the desktop, select it, and click Open. 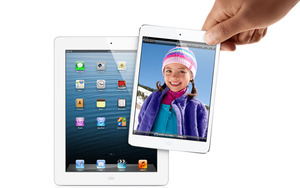 redsn0w will prepare the restore image, your iPod will be placed into Recovery mode, and the update will be installed. redsn0w will display an alert telling you when the update has been successful. You can then sync it with iTunes (where you hopefully have a backup of your data, as restoring the device in this way wipes all your data from the iPod).